for 21 Panzer Division. The following is one such chart with explanation and references. Captured German Documents section 312, roll 1566. Headquarters units for Regiment and each Tank Battalion. The I. Battalion is fully re-equipped with Mk IV tanks. The II. Battalion still retains some ex-French Somua tanks. This battalion is due to be refitted with Mk V Panther tanks. already at Mailly-le-Camp (near Paris), to await delivery of Pzkpfw IVs when D-Day occurred. from right to left. 1. Company has 16 Armored Cars armed with 20mm cannon. 1 with a 75mm howitzer. 3. Company has 11 armored half-tracks with 2 81mm mortars, 3 37mm AT guns, and 6 with 20mm cannon. 4. Company has 37 Half-tracks similarly armed. 5. Company has 27 Half-tracks, 1 with 37mm AT gun, 3 with 75mm AT guns, 6 with 37mm AA guns, 2 with 75mm howitzers, and 2 with flame-throwers. 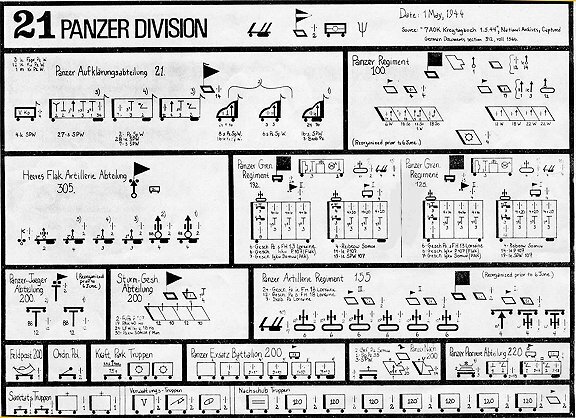 This shows the two Panzer Grenadier Regiments (192 and 125). Each Regimental HQ Company has 3 50mm AT guns,a section of Pioneers, and a motorcycle platoon. Each Regiment is supported by a company of 6 self-propelled howitzers and a company of a section of 4 self-propelled 81mm multiple mortar launchers and a section of 4 self-propelled rail 150mm rocket launchers. The first (Armored) battalion of each Regiment is carried in half-tracks of French design. There are 3 infantry companies and 1 heavy weapons support company per battalion. Each infantry company has a section of 3 75mm howitzers. The support company has 3 20mm AA guns on French P107 half-tracks and 3 75mm AT guns on French Somua half-tracks. The second (Motorized) battalion of each Regiment is carried in assorted trucks. 88mm anti-aircraft guns. The next three batteries were equipped with 20mm anti-aircraft guns. A section of the 5th Battery contained 2 quadruple-barrelled 20mm anti-aircraft guns. This shows Anti-tank Battalion 200. Just prior to D-Day, the battalion was re-organized from two batteries of 12 88mm towed Anti-tank guns to three batteries of 6 guns each. This shows Assault-gun Battalion 200. The HQ company is equipped with 12 47mm AT guns on Renault 35 chassis. There is also a section of towed 75mm Anti-tank guns. The four gun companies consist of self-propelled Anti-tank guns (75mm) or artillery (105mm), built on ex-French Hotchkiss chassis. This is the Engineer Battalion for the Division. The first two companies were transported in half-tracks. The third was carried in trucks. The fourth is the bridging section, which also carried pneumatic boats for crossing river obstacles. This map shows the deployment of the Division just prior to the invasion. 39-45 Magazine, Number 1, Editions Heimdal, December 1983, pages 13-19.